In my role as a Michigan DUI lawyer, examining the evidence is a critical step in every drunk driving (OWI) case I handle. Can you imagine a doctor or dentist treating a patient without first conducting a thorough examination? It’s essentially the same thing for a lawyer to properly (emphasis on proper) represent someone facing a DUI charge. As much as any doctor, dentist or lawyer will want to know what the problem is, he or she will also want to know what it is not. In the context of a DUI arrest, a driver’s contact with the police and what follows, including the stop (was the car, in fact, swerving? Did it cross the yellow line? Did the driver commit some other traffic infraction? ), the field sobriety tests, and the arrest itself aren’t just important to the case, they essentially make up the case. As a result, it is standard practice in my office to obtain and review the video evidence in almost every drinking and driving case that crosses my desk. In this short article, I want to make clear why it’s always prudent to obtain and review the police car dash-cam video. As a general rule, there is never a good reason to NOT get a copy of the in-car police video. Many “cut rate” legal operations and court appointed lawyers skip this step, principally because they don’t have enough time to do it, especially for what they’re (often not) paid. Bargain, cut-rate law offices make their money on the quick turnover of cases, and court appointed lawyers are expected to wrap up a case in just a few minutes after meeting their assigned client in court. When you hire a good lawyer, however, you should be paying for him or her to do everything necessary to insure the best outcome in your case without wasting time or money on things that won’t. Reviewing the dash cam video is always the smart thing to do. Moreover, even in those cases (the majority of them, really) where the dash-cam video does not reveal some catastrophic police mistake that will get the case tossed out of court, or otherwise demonstrate the the driver was not over the legal limit, just knowing that to be the case provides clarity and removes any doubt as to the best way to proceed. Sometimes the dash-cam video can lay a golden egg, and be used as the basis to challenge the evidence. Whatever else, DUI cases don’t dismiss themselves, and one thing is for sure: you will never find a reason for a case to be “knocked out” without looking for it, first. The mindset with which the evidence is approached has a lot to do with this. 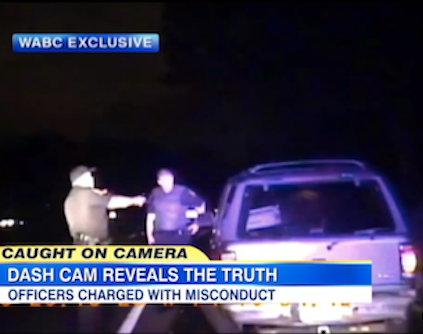 If you watched almost any DUI dash-cam video with the instruction to find confirmation or evidence that the subject was driving drunk, you’d probably find some. Because you were focused on confirming something, you would almost automatically overlook anything that indicated the contrary. This is known as “conformation bias.” As a DUI lawyer, I have to assume a contrary conformation bias perspective, namely, that my client did NOT do anything wrong, or anything too wrong, and that if his or her performance on any of the field sobriety tests was something less than optimal, there is a good and rational explanation for it. Even approaching these videos with an “open mind” isn’t good enough; they have to be watched with an eye to finding those things that help the client. Instead, the police report is going to set forth all the reasons the police believe the arrest was justified, and it’s no secret that they tend to get laid on a little thick. Officers routinely report being able to smell alcohol and see that a driver’s eyes were red, bloodshot and/or glassy. While those things probably do exist in most cases, how can the officer smell alcohol from a rolled-down window on a windy night, and see that the driver’s eyes are red without using his or her flashlight? While these things may not be enough to get the case tossed, if the prosecutor meets with the defense lawyer to negotiate the case and all he or she knows about it comes from that one-sided police report, what good can come of that? By contrast, the playing field shifts when the defense lawyer can point out any inconsistencies between what was stated therein and what the video does, or does not, show. It certainly cannot hurt, in any way, for the defense lawyer to have this kind of ammo, but you will never get it if you don’t go looking for it first. And while prosecutors don’t watch the dash-cam video unless it’s brought up as part of a legal issue, the probation officer will never see it in any case, period. Instead, the probation officer will completely and blindly rely upon the police report as the objective, truthful and unbiased account of exactly what happened, and the DUI driver will be treated accordingly. This is really important because the probation officer is responsible for writing the sentencing recommendation that the Judge will use when he or she decides your fate. The sentencing recommendation is part of a larger process called a pre-sentence investigation (PSI), and while it’s too much to explain here (I do that in plenty of my other DUI articles), you can count on it as essentially being the blueprint for what the Judge is going to do to you. If that report is based upon information that is not only incorrect, but demonstrably so, then you are severely disadvantaged by not knowing that, or otherwise not being able to point that out in your own defense. Thus, if in deciding what to recommend for your sentence, the probation officer has it in his or her head that because the officer made it seem like you didn’t pull over right away and kept driving after the emergency lights were activated, then he or she is going to think of you as defiant, or uncooperative, and that will likely affect his or her recommendation for your supervision. If, however, you can point out (and be able to prove, if necessary) that it wasn’t any kind of defiance on your part, but rather that you just didn’t want to pull over on the busy street, and instead slowly drove up to the next turn-in (like a side-street or a parking lot) and then stopped, that can change the Judge’s whole perception of things and affect what happens to you. If you’re getting the idea that it’s good practice for your lawyer to obtain and examine the dash-cam video of your stop and arrest, then you’re getting the point here. While it would be difficult to list all of the possible reasons why it should be done, there is only one possible, seldom-existing reason why it shouldn’t – timing. In the highly unlikely case, for example, that Florida Fred is pulled over in Michigan and arrested for a DUI, and that, by sheer luck, his 2 prior offenses in Florida didn’t show up when the police took him in, meaning he could (and likely will subsequently) be charged with 3rd offense (felony) DUI, an astute lawyer may run him into court before any of that is discovered and plead him, straight-up, to the 1st offense OWI on his citation, thereby avoiding a felony charge later on. I’ve had something like this happen a mere handful of times in almost my 27 years as a lawyer, and unless you have some undiscovered DUI’s in your past, that means there is probably no reason in the world why the dash-cam video of your arrest shouldn’t be viewed. That’s really the takeaway here – your lawyer should get and view the police dash-cam video. There are exceptions, or course, but those should be examined on a case-by-case basis. For the most part, there is no real downside to being thorough, especially since the cost of these videos is negligible anyway. If you’re looking to hire a lawyer for a DUI case anywhere in the Metro-Detroit, Tri-County area, do your homework. Don’t sell yourself short, but don’t get sold a bill of goods, either. Be a smart consumer and check around. In my office, all consultations are done over the phone, right when you call, and you can find us here to help, Monday through Friday, from 8:30 a.m. until 5:00 p.m., at 586-465-1980.